Instantly unlock PDF restrictions and enable editing, printing and copying of locked PDF files. 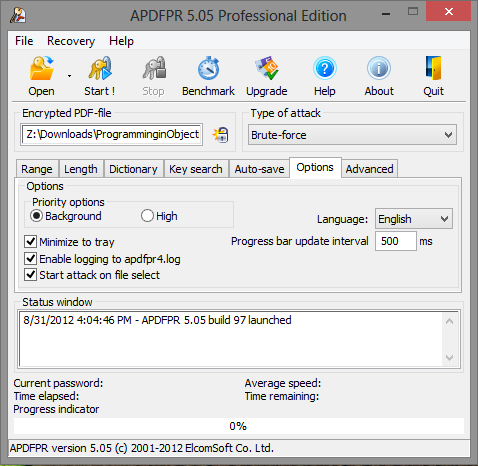 Recover original PDF passwords with configurable attacks. Break 40-bit encryption in under a minute with patented Thunder Tables technology. Supports: Adobe PDF, 40-bit and 128-bit RC4 encryption, 128-bit and 256-bit AES encryption, PDF with printing, copying and editing restrictions. Unlocking PDF. Guaranteed password recovery for Adobe Acrobat. Remove annoying restrictions from PDF files! Advanced PDF Password Recovery instantly unlocks PDF documents that restrict you of printing, editing or copying of data to clipboard. This is by far the most common protection found in PDF files. If you can open a document without a password, but cannot print it at all or are restricted to low-quality output, or if you cannot copy data to clipboard or cannot edit the document, read no further and get Advanced PDF Password Recovery Standard edition! What if you can’t open a PDF document at all without knowing the correct password? In that case, you’ll need the password recovery feature found in the Professional and Enterprise editions of Advanced PDF Password Recovery. The PDF format specifies two types of protection: the weak 40-bit and the strong 128-bit encryption. 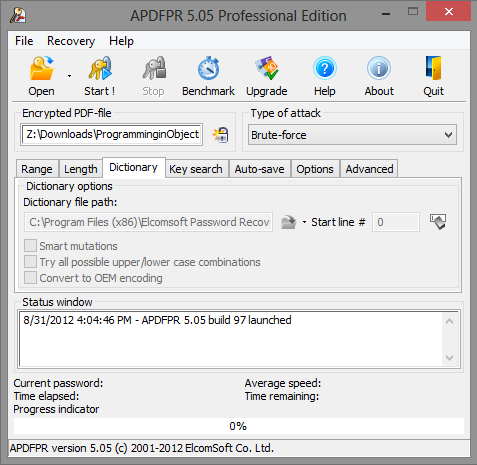 Advanced PDF Password Recovery guarantees the recovery of 40-bit keys by attacking the encryption key instead of attempting to guess the password. 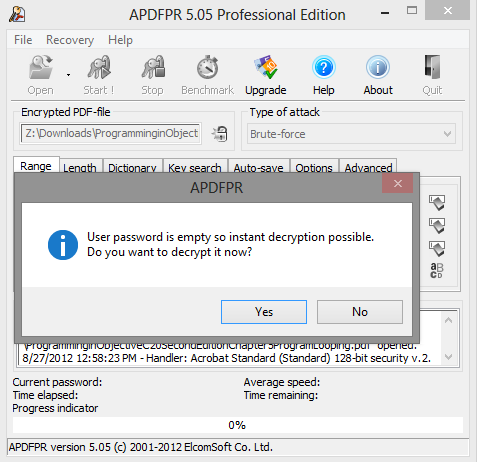 While the Professional edition takes up to several days to recover a PDF document protected with a 40-bit key, the Enterprise edition can unlock an encrypted PDF in a matter of minutes! The unique Thunder Tables® technology developed by ElcomSoft uses pre-computed tables to significantly speed up the recovery of 40-bit keys. The technology is available in the Enterprise edition, and will unlock a protected document in a matter of minutes instead of days. Most passwords used by living beings are based on a word or phrase. Performing a dictionary attack by attempting different combinations of cases and variations of words and characters before reverting to a comprehensive brute-force attack allows for considerate time savings shall the attack succeed. 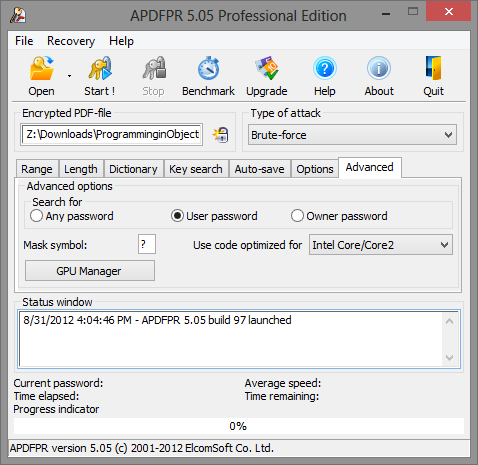 If the password does not fall into any dictionary, Advanced PDF Password Recovery attempts all possible combinations of passwords by performing the brute force attack. The highly optimized low-level code provides the best-in-class performance for the brute-force password recovery. Multi-threaded optimization ensures optimum performance on the modern multi-core CPUs. Trial version decrypts only first 10% pages (but at least one page) of the documents, and replaces all other pages with blank (empty) ones; with a brute-force attack, passwords longer than 4 characters cannot be recovered; some dictionary-attack options are disabled; "Use pre-computed hash tables" option is not available.